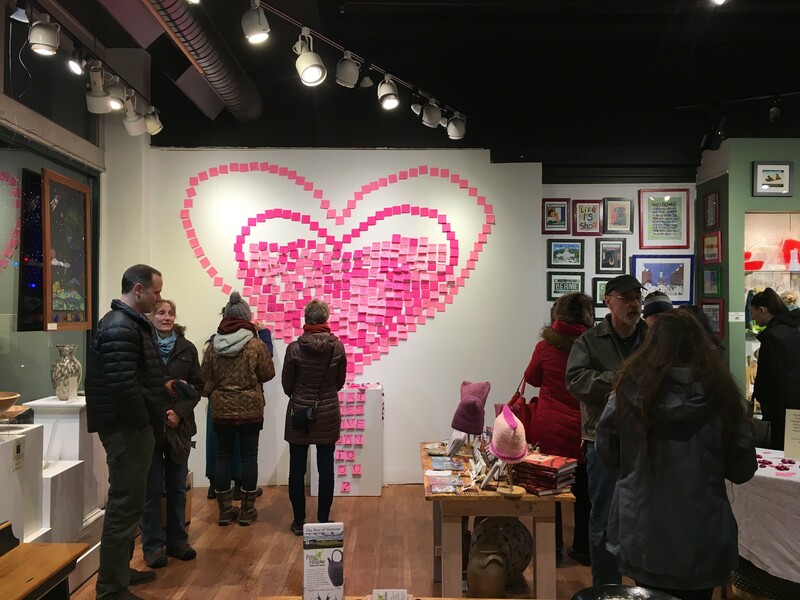 On Friday night, Frog Hollow Vermont Craft Gallery in Burlington hosted an opening for its monthlong "Wall of Love" show. Conceived by gallery manager Meredith Mann, it bears a striking resemblance to the Post-it Notes piece titled "Subway Therapy" by New York artist Matthew "Levee" Chavez. That installation provided people with a chance to share their post-election feelings in public, at the 14th Street/6th Avenue station in Manhattan. Frog Hollow director Rob Hunter shied away from the comparison. "I'm sure Chavez' work was rattling around in our subconscious when we conceived the show, but [that exhibit] was not specifically mentioned by anyone [here]," he explained. "The main goal was bringing people together out of their homes in the cold months." 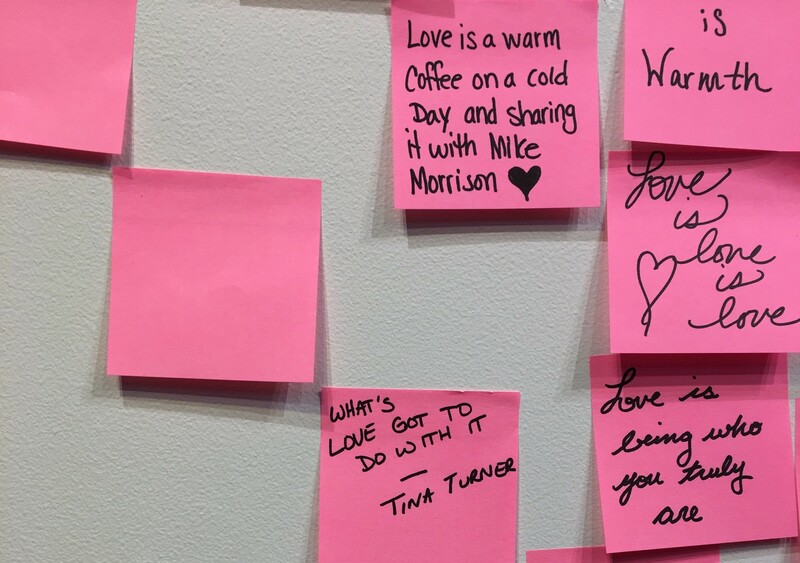 The exhibition promotes a Valentine's Day theme, asking participants to express their love in pink note form. Passersby can walk in from the Church Street Marketplace and make additions through the end of the month. Some of the first entries offer that love is "all you need" and "cat naps." Chickens make numerous appearances, as do references to children, coffee and pizza. A couple of messages veer toward the political, including the note that reads, "Love is hating Trump." Hunter said one of the first stickers to go up had a pro-Trump message, and another patron tried to take it down. It's unclear whether the self-commissioned edit still stands; this reporter couldn't find the note on the wall. But Hunter pointed out that his organization isn't in the business of censoring. "This is what people are feeling," he said. And some people, apparently, question their emotions. On the outer edge of the heart-shaped installation, a light-pink note reads: "What's love got to do with it? — Tina Turner"
Who knew Tina Turner was in Burlington! ?